We want you to get out there and explore this new ocean. For this event, your task is to find any island on the ocean, walk around it some, take some screenshots for reference, and then build a model. You may model any island on Malachite ocean, but you are encouraged to explore beyond the inhabited Lacerta archipelago. 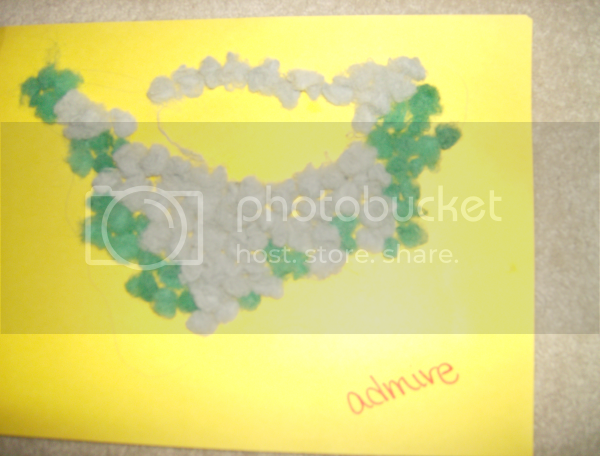 Build a model of an island on Malachite. 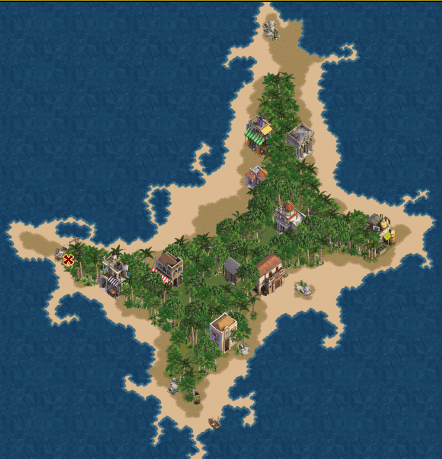 If the island is inhabited, you must include any buildings that are on it. 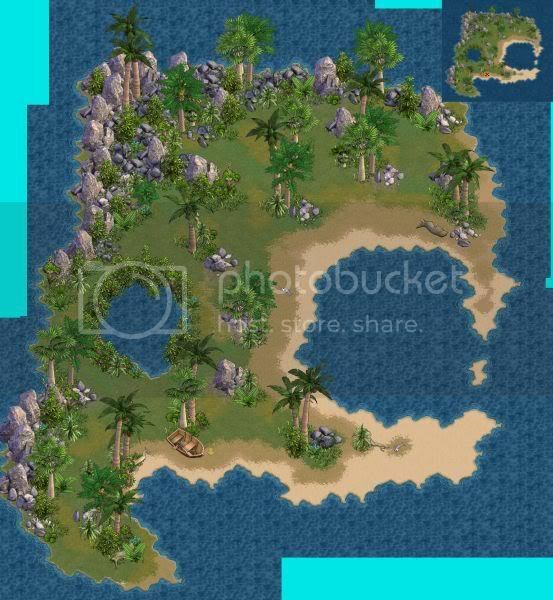 Take a screencap of the minimap of the island you are modeling. 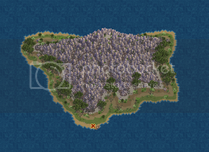 You may also want to take screencaps of specific features that you would see while walking around that island. 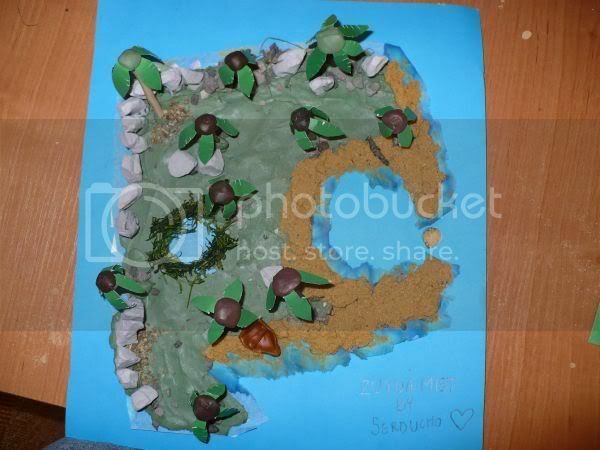 Create a model of the island. You are encouraged, but not required, to use natural materials. Take at least two photos of your creation - one in-progress and one completed. Include your pirate name somewhere in the photo. Crop and resize all images to be no larger than 600 pixels per side. Post your entry in this thread. Use the template below to make sure you have everything you need. The deadline for this event is Sunday, June 1 at 11:59PM game time. Entries posted or edited after that time will be disqualified. Have fun. I can't wait to see your entries! Can we make more than one entry? Obviously I don't think someone can be eligible for more than *one* prize, but can we submit many entries still? Yes you guys posted this just 2 days ago and I was like OMG i have to do it. 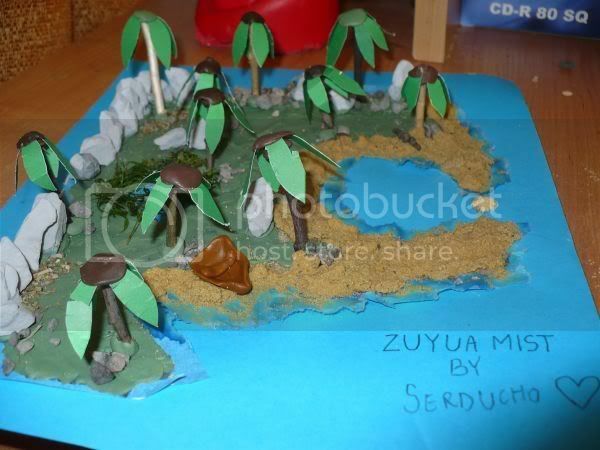 The island I did is Mu Abtu and I am posting the pics in a sec, I need to resize them. I have a question too: Does the Mirror trinket comes with another inscribable trinket for stating we won first prize? Does the Mirror trinket comes with another inscribable trinket for stating we won first prize? No, it's just the uninscribeable mirror. So, here it is! After doing some random stuff, and cropping hte images to 600x400 and you know, important stuff, here it is my entry! 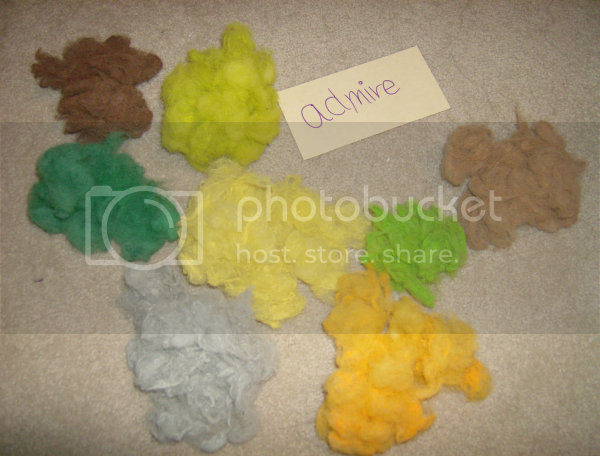 The materials I used before the transformation. In the picture I didn't showed the rocks because I didn't picked them up by that time, but the rocks are REAL rocks :O amg. I know. LOL. So, after some days and the forums down, I show you another creation. Materials were basically the same of the last one: the clay that was left over, plus some rocks. No biggie. Step 1: Island's shape and soil. Here. Step 2: Island's trees and shadows, Here. Step 3: Island's rocks and snow, Here. Will the lovely ribbon and rose trinkets be inscribed with the winner's name and other relevant information? That is the reason I want the ribbon over the mirror: It will have MY name on it! *begs so mirrors are made inscribable. * PLEASE?? You are inspiring me to give it a shot. I have some ideas but I hope I have the time to go with them. Oh, and I think people should see Quitex's in the side by side so you can see how good it really was. Well done! I shrunk it down a bit so that it fit side by side better. If that was the case, Yesterday and I would be having a pillow fight in a pool full of chocolate pudding by now. What did you use for the snow, it looks like flour. :P Sorry, just curious. Oh good catch. It is... ummm how you call it? The thing you put to the babies in their daipers so they don't get itchy. When four pirates get extremely bored... and they have an excessive amount of blue sheets. Although the objective was to build an island, we ended up building the lagoon in the middle of the island, kinda D:, despite cyclonic winds. 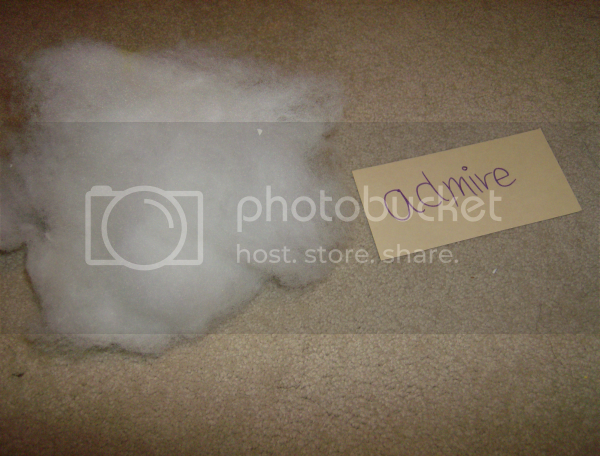 Starting out: 1 basic material. 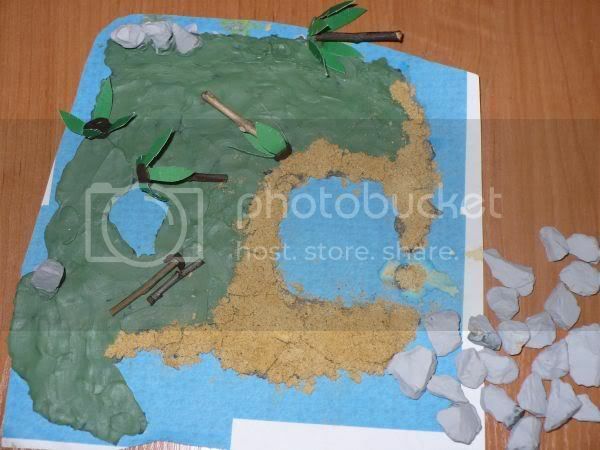 WIP 3: Creating the island on a piece of construction paper. 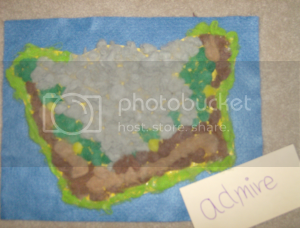 Final product: Cutting out the island and using a piece of blue felt as the ocean. To fix the tags: Take off all the tags you have right now and just add [img...] and [/img...] (without the dots) and you're set. And for the ones you show halfway through, please use [url...] and [/url...] without the dots. lol thanks, it took me forever to make those trees. had to shape them with my hands and was laying down on my back for the longest time rolling little balls of clay for those clumpy trees :P.
It got me forever to build A.S.!! the freaking clay refused to get on the cardboard. LOL.